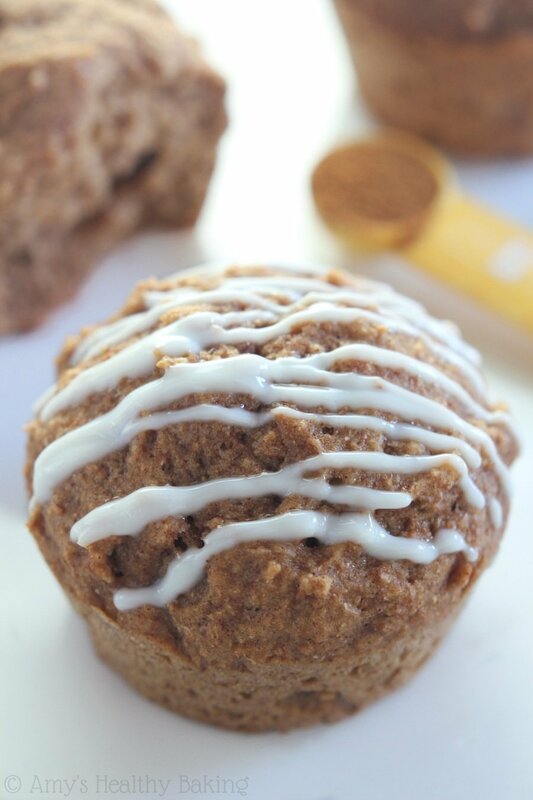 Tender chai- & cinnamon-spiced muffins topped with sweet glaze. They taste like the beverage, so you can have your drink and eat it too! Last month, I spent some time at my parents’ house after all of the craziness of moving. That first weekend, it felt blissful to sleep in and not run to Home Depot four times a day for more boxes and packaging tape. But then… Monday morning hit. For the past two months, a construction crew has shown up before 7 am to work on my parents’ kitchen remodel. They’re incredibly sweet guys, but it’s impossible to knock down walls and build new cabinets without hammers, saw, and all kinds of loud equipment. So that was the end of relaxing mornings for me! Yet even after the first few days of that new routine, I didn’t quite learn my lesson. I stayed up late, typing out blog posts and editing photos, so when my new banging hammer alarm clock sounded in the morning, I’d groggily slide out of bed to start the day. The beginning of the days weren’t quite as bad, seeing as I’ve always been a morning person, but by the time mid-afternoon rolled around, my eyelids drooped and threatened to stay shut. With lots of recipes left to test, I turned to my mom’s favorite caffeine source—chai lattes—to power me through until nightfall. 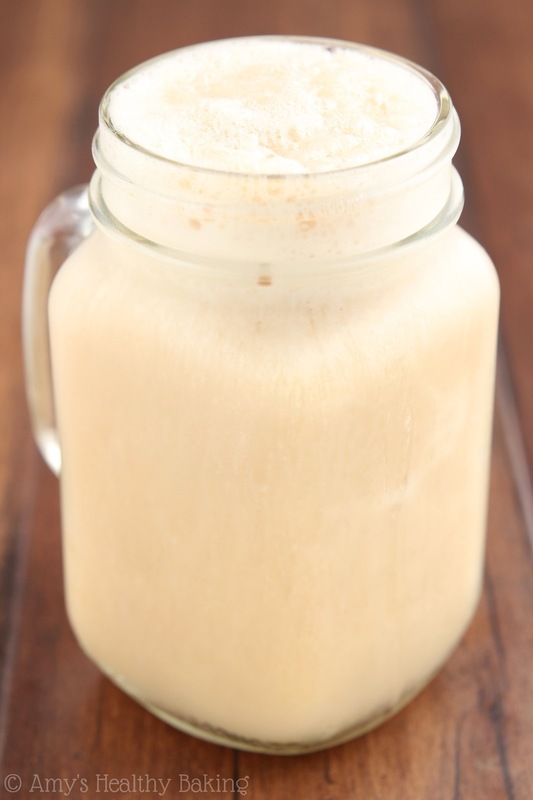 Up until then, I had never actually tried a chai latte, but after my first sip, I was hooked! That warm cinnamon, that rich tea, that sweet balance of milk… I actually started looking forward to drowsy afternoons just to have my chai pick-me-up! So this past week, when my stomach quietly started rumbling right around the chai hour, I decided to mix up some muffins to go with my drink. 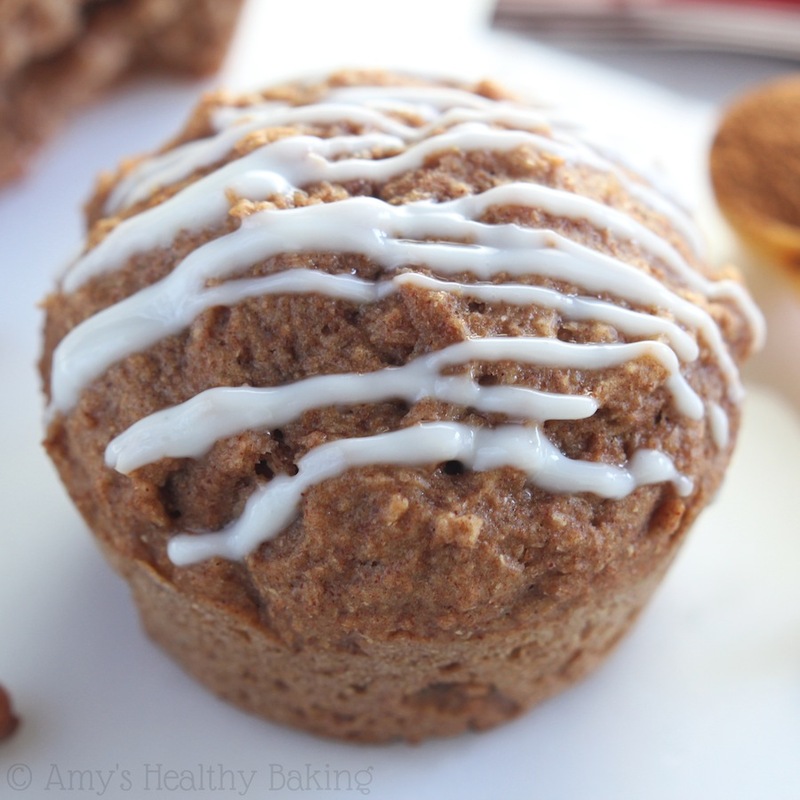 These healthy Chai Latte Muffins with Vanilla Drizzle were the result! To start, we’re going to need chai tea. I know it sounds strange, but for the maximum chai flavor, steep the tea bag for at least 30 minutes. I think I left my mug for closer to an entire hour. 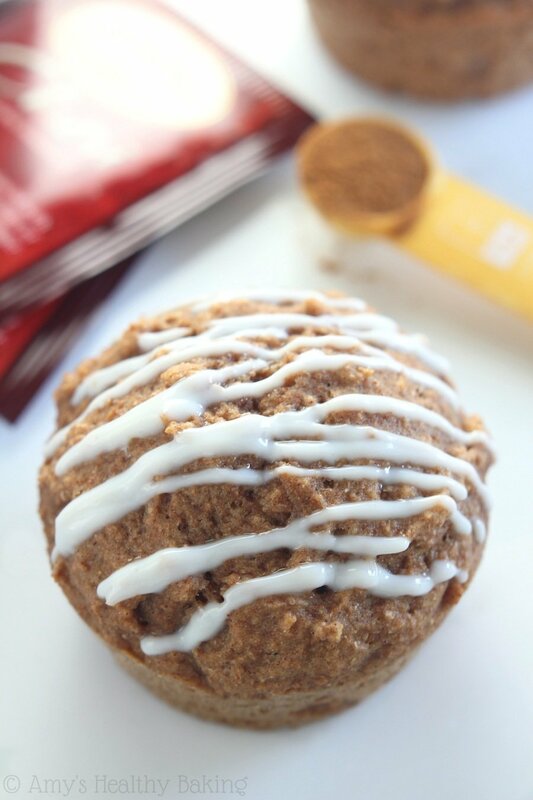 Because you’re using just ½ cup of tea to flavor 10 whole muffins, we need it to be extremely strong! 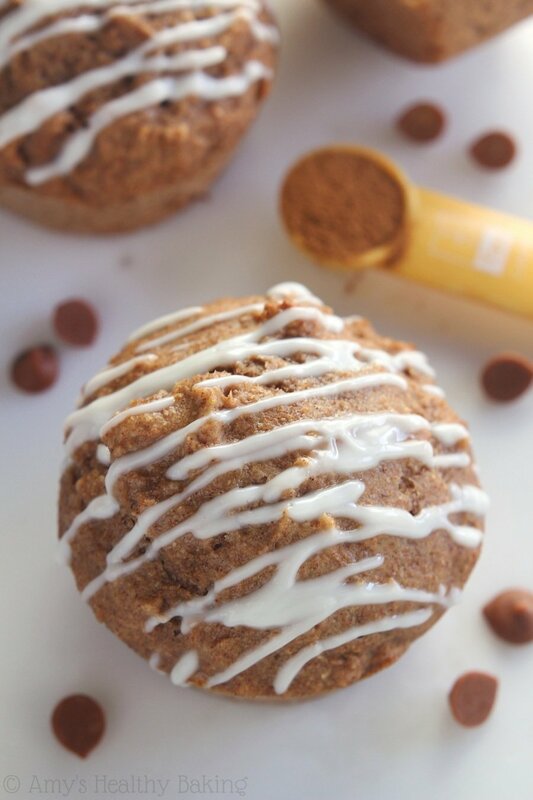 To make these healthier muffins light and tender, we’re going to rely on a few little tricks. First, we’ll mix in lots of Greek yogurt. 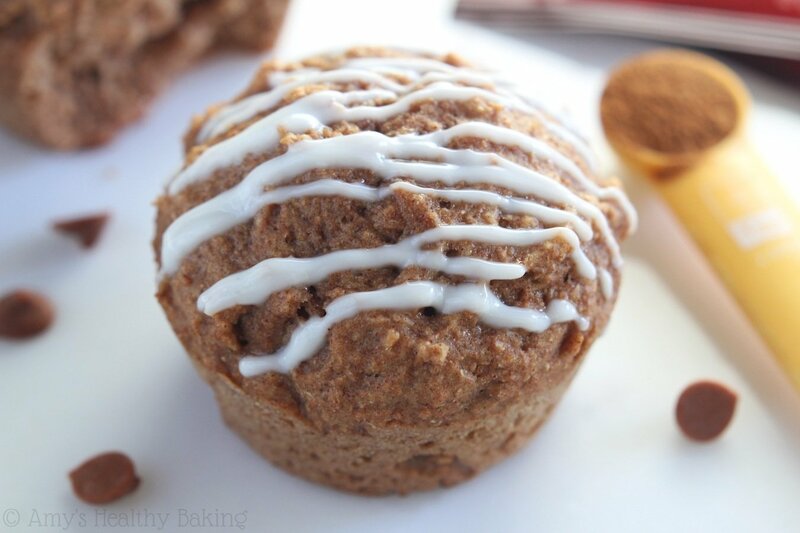 With just 1 tablespoon of butter, these muffins get the rest of their tender texture from the Greek yogurt. It adds all of the moisture for just a fraction of the fat and calories. Plus it sneaks in a little extra protein boost too! Secondly, we’re going to mix the muffin batter just like cake batter, so that means alternating additions are mandatory. Mix in a little flour, followed by a little tea, and continue switching between the two, stirring just until they’re incorporated. This method prevents over-mixing the batter, which would overdevelop the gluten strands and lead to tough muffins. Not quite the soft pillow-like texture we’re after! And now for the drizzle! I’m not a huge fan of the taste of powdered sugar, so I use Greek yogurt as the base for my glaze instead. It’s sweetened with a little agave and Truvia, plus a hint of vanilla extract to round of the flavor. 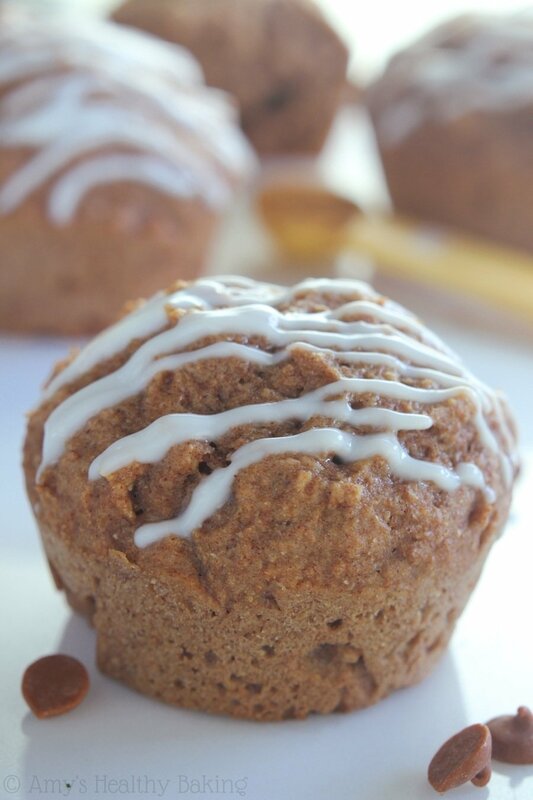 The glaze is the main “latte” taste of these muffins, so drizzle it on nice and thick! “Umm, not quite…” he responded. “Yes… But I know better.” He laughed and walked out. So as soon as I finished, I brought one into the office for him. I fully expected him to take a bite and hand the rest back, like he does with all of my baked goods. After he swallowed he walked back towards the kitchen, with me following nervously, grabbed the glaze, and completely covered the top before polishing off the entire muffin. With how picky he is, these must be some incredible muffins! 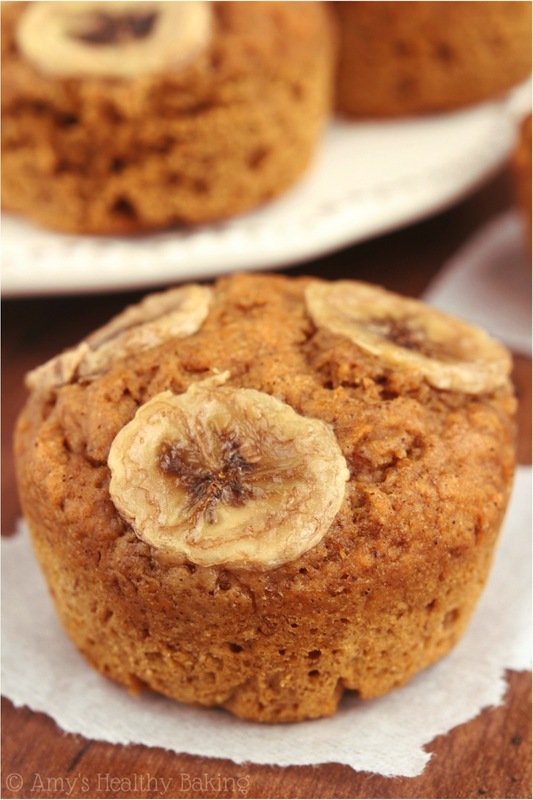 These muffins are soft, tender & so easy to make! 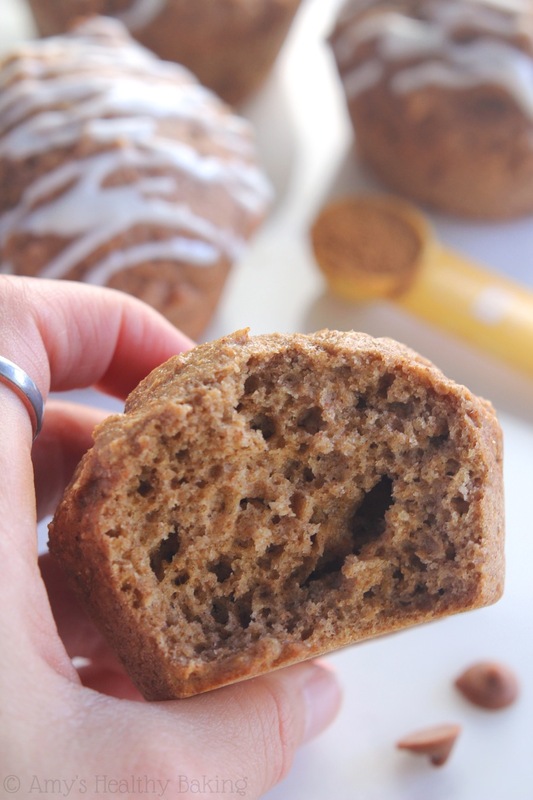 They’re perfect for tea and cinnamon lovers alike. They’re best if eaten the same day that they’re drizzled. Store any leftover muffins and glaze separately in airtight containers in the refrigerator for up to 5 days. Preheat the oven to 350°F, and lightly coat 10 standard-sized muffin cups with nonstick cooking spray. Divide the batter between the prepared muffin cups, and bake at 350°F for 17-20 minutes, or until a toothpick inserted into the center comes out clean. Cool in the pan for 5 minutes before turning out onto a wire rack to cool completely. To prepare the drizzle, stir together the Greek yogurt, Truvia, agave, and vanilla. Spoon into a zip-topped bag, and cut off one corner. Drizzle on top of the cooled muffins. Notes: For the gluten-free flour, I used as follows: 1 c (120g) millet flour, ½ c (60g) brown rice flour, ½ c (60g) tapioca flour, and 2 tsp (6g) xanthan gum. 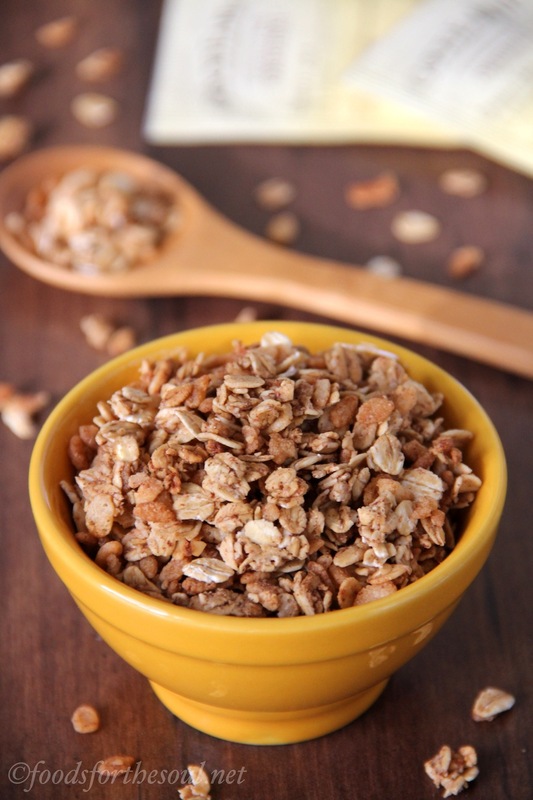 If you do not have Truvia, substitute an equal amount of granulated sugar or ½ teaspoon (1g) of powdered Stevia. These are not chai flavored only cinnamon flavored, there isn’t any cardamom, pepper, anise, allspice, nutmeg, or ginger in the recipe. Please rename the recipe or fix so that it tastes like chai. Is Coconut flour a substitute or not? No, do not substitute coconut flour in this recipe. I’m excited to hear what you think of the muffins Keikii! I was excited for these but I went wrong somewhere and they came out dry 🙁 it stinks because sometimes you just don’t know what you did wrong and then you can’t fix the mistake for next time. I do wonder if something is wrong with my oven: you said to cook for 17-20 minutes but I think mine were only in there for like 10 and I had to take them out. Maybe I should set the dial to 300 degrees instead from now on? I’ve had to take other muffins out early, too. Also, I couldn’t taste the chai tea in the muffins at all. I even steeped the bag for longer than 30 minutes! I’m disappointed with this attempt of mine but I’ll keep trying. Only my fourth time ever baking really. How did you measure the flour? Did you use a measuring cup to scoop it directly from the container? To increase the chai flavor, you can try steeping 2 or 3 tea bags for about 60 minutes. The longer you steep the tea, the more flavor you’ll get. 🙂 We’ll figure out all of these issues so your next batch turns out much better! Thank you for responding! I don’t have an oven thermometer. Would a meat thermometer work? Lol. A convection-style oven is your typical oven, right? That’s what I have, I think it’s just old. I made standard size muffins. I measured the flour using your technique. But I kind of pressed the flour down into the cup at the very end before I took a knife across the top. Maybe that was a mistake. I’ve been confused on what the consistency of the mix should be at the end before I spoon it into the muffin cups. Should it be kind of thick and sticky, or more like pancake batter? My textures have all ended up thick and sticky and I’ll keep adding milk until it thins. I wonder if that’s been a terrible idea. Please help! It’s my pleasure Taylor! I wouldn’t use a meat thermometer since many of those only go up to around 200°F. A convection-style oven has a fan component that helps circulate air around the oven. Does yours have a fan or make a constant humming sound? Thanks for the information! Do not press the flour down into the measuring cup. That results in extra flour, and that extra flour will dry out your muffins. Just lightly spoon the flour into the measuring cup (I actually prefer to use a fork to scoop the flour from the canister, and I lightly “sift” the flour into the measuring cup by shaking the fork back and forth! ), and when you have a mound of flour across the top of the measuring cup, drag the back of the knife across it. Measuring your flour like this will give you the correct amount! Can you use all-purpose flour in this recipe? I really appreciate your interest in my recipe Gabi! I’d love to work with you to solve that issue. 🙂 Did you make any modifications, including those listed in the Notes section of the recipe? How long did you steep your chai bag before adding the tea to the batter? 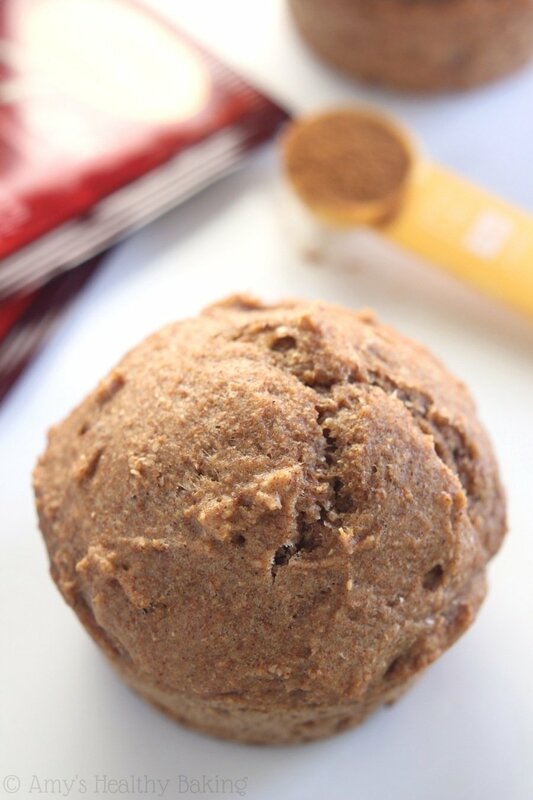 How much extra spice did you add in addition to the 1 tablespoon of ground cinnamon?